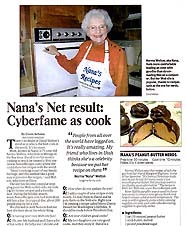 We received some exciting media coverage for Nana's Recipes. The Sacramento Bee (California's 3rd largest newspaper) ran a feature story about Nana's Recipes in their Wednesday, February 5th food section. 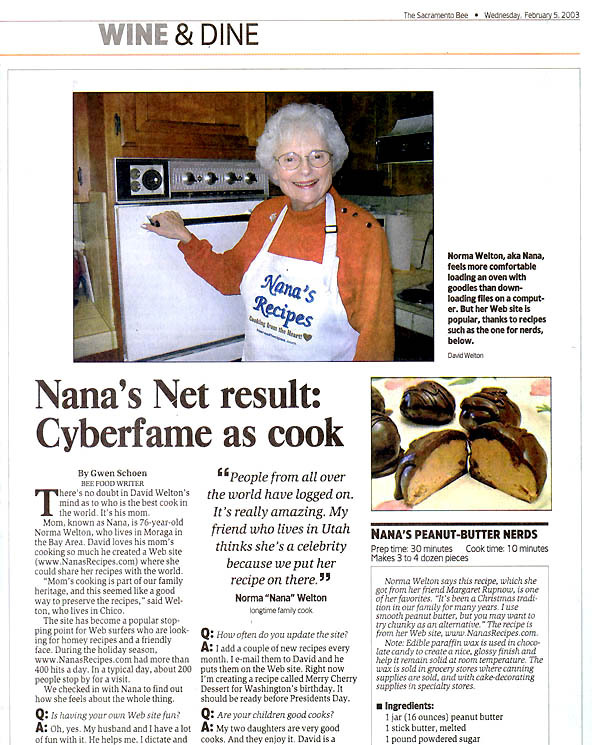 The newspaper article includes an interview with Nana, and highlights her Nerd Candy recipe. Take a look at a portion of the print version of the article complete with pictures (110K image file) and read the entire article on the Sacramento Bee website. This month we've added an easy lasagna dish that is prepared in a crock pot (slow cooker). Also new is a bright red cherry dessert that Nana calls Merry Cherry. There are now 375 people on our Monthly Update e-mail list -- including 70 new people this month! Join Nana's Monthly Update list and keep updated. We now have 234 recipes. The Recipe Index alphabetically lists all recipes on the site. One click takes you to the top of the appropriate page. If you enjoy the recipes offered here, please consider donating ($5.00 or anything you can) to help us offset the expenses associated with this website. Please click on the PayPal logo below to donate.